In 1911 a large hall was built in Birkenhead. It was called the Foresters Hall and became the centre of our social life for many years. We thought it very grand with a balcony and small party room upstairs. As a small child I was taken every Saturday night to the pictures at the Foresters Hall - those wonderful silent films. At first I never saw more than the "News of the World" for by that time I was fast asleep. The man at the piano was Tom Coward and Ted Lanigan later replaced him. It was worth the money to see Mr. Lanigan in his collar at least four inches high and his twirled moustaches - watching the film and playing music to meet all situations of the story. When he walked to the piano the applause and stamping from the young locals was deafening. Among the regulars on Saturday night were Mr. and Mrs. Swindail plus their fox terrier dog. This dog occupied a chair between them and never took his eyes off the screen. I often wondered if they paid half or full admission price for him. Then came World War I, and I remember the Foresters Hall being used for farewell concerts given to the local boys going overseas, my Father being one of them. Who can forget Tom McDowell singing "Till the Sands of the Desert grow Cold" and "Little Grey Home in the West"? Some time later in the same hall he was singing "Land of Hope and Glory" at their Welcome Home, in his beautiful baritone voice. Then the Flu Epidemic took hold and the old hall came to the rescue as an emergency hospital. Local girls rallied round as nurses and did a great job. Bulletins were put up each day outside the hall giving progress - or death - of the patients. Next in line was the auxiliary school. 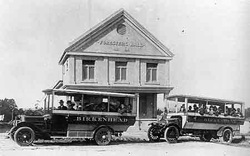 While waiting for the Birkenhead Primary to be built, classes were accommodated in the faithful Foresters Hall. Then in the 30's we had the Birkenhead Municipal Band giving Sunday night concerts in the hall. These were very popular - after all, there was nowhere else to go on a Sunday night! But the times were changing. No more did Mr. Lanigan have to play "Melody of Love" or "Napoleon's Last Charge". The talkies were here and Henry Hayward switched over. The old hall was almost a community centre on picture nights. Huge cane prams containing sleeping or screaming babies filled the foyer, for the only family entertainment was at Foresters Hall, now renamed "Kiwi Cinema". Slowly, radio, then television took over. The grand old hall fell into disuse. Several revival attempts failed. In the 1960's it was a junk shop - and then nothing. It was demolished about 1970 so our memories are all that is left of our grand old Foresters Hall.